The very first time I made this, I kinda wasn’t convinced how it would turn out …. a sweet crumble on top of something so savory? But oh my when it was baking … the smell of the cinnamon was heartbreaking! And the taste, sweet with salty … lovely! Do not be put off…first give it a try … I guarantee you will be making it a few more times! Put the sweet potatoes to boil for a few minutes till they are nearly cooked. Drain and keep half of the sliced ones aside. Mash the other half, season and add the beaten egg and grated Parmesan. Mix well. Spoon the mashed potates on the bottom of a greased oven proof dish. Level and set aside. In a little pan, melt the butter, stir in orange juice, honey, brown sugar and the ginger and cook until syrupy. When slightly cool, add the sliced sweet potatoes and toss to coat. Drain and set aside. Heat a little oil in a pan and sautee the onions and garlic until soft. Add the minced pork and brown. Sprinkle with the spices and mix them in the meat mixture. Add the Port, the stock powder, the tomato paste and the tomato pulp. Leave to simmer. In the meantime, preheat the oven at 180C and prepare the crumble. Put the breadcrumbs, oats, brown sugar and cinnamon in a bowl. Add the chopped butter and rub it in like you would do when preparing pastry. Add the chopped pecans and mix them in too. 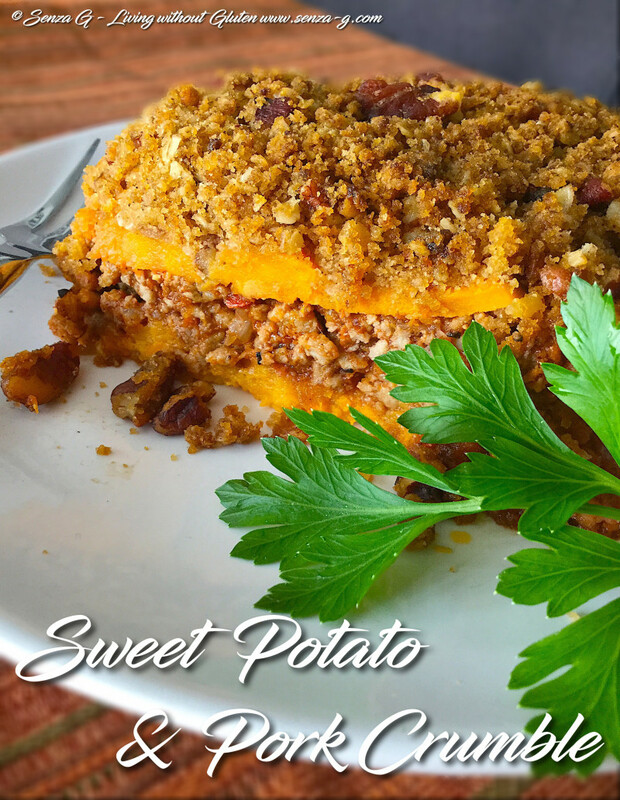 Pour the minced pork mixture over the mashed sweet potato layer and level. Top with the reserved sliced sweet potatoes. Sprinkle the crumble over the top and place in the oven. Bake for about 45 minutes. I find that it will be easier to serve if you bake in ovenproof individual dishes.